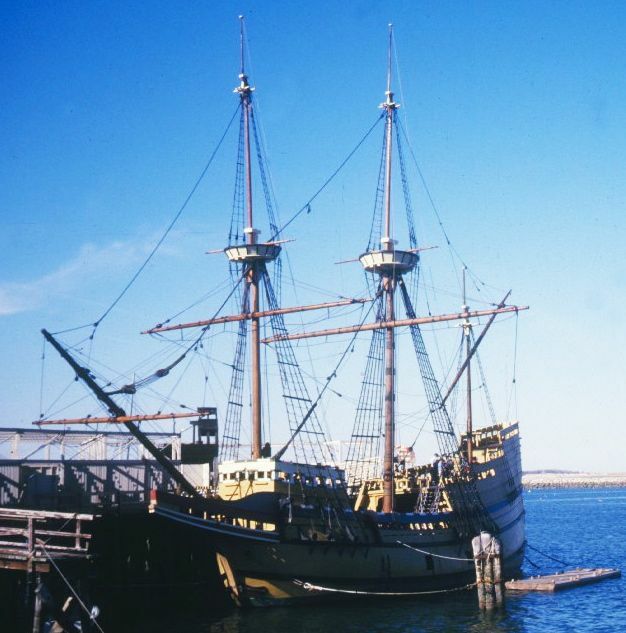 Although this 1956 reconstruction was intended to represent the Pilgrim Fathers’ 120-ton ship Mayflower of 1620, its design was largely based on late 16th century English sources. As such it gives a good idea of the appearance of the privately-owned ships in the English fleet that fought the Armada in 1588, eight of which became fireships. The English fireship attack on the Spanish Armada on the night of 7th/8th August 1588 was the most effective assault made by an English fleet in the 16th century. The event is well known, but I want to look at it again because of its historical importance and because it is a story that has some uncomfortable resonances with our own times (1). King Philip II sent the Armada in order to topple the Protestant Queen Elizabeth I and restore England to the Catholic faith. War had broken out between the two nations in 1585 and would last until 1604. At no point in the conflict was England capable of destroying Spain, which had the world’s greatest maritime empire, but the Spanish perceived the English as a real threat. Amongst other things, they gave support to the Dutch Protestant rebels fighting Philip’s Army of Flanders, and English ships frequently attacked Spanish vessels and possessions. The strategy of the Armada campaign was simple. The Spanish fleet would sail up the Channel, avoid major battles with English naval forces, and link up with the Army of Flanders in the Low Countries, which was commanded by the Duke of Parma. Once this had happened, the Armada would convoy the Army across to England in a fleet of small vessels, landing in Kent. The Armada was to contribute its own soldiers (more than 20,000 men), siege guns and military supplies to Parma’s force, and the joint army would then march on London. If the Armada had landed, the Spanish army – the most professional force in Europe – might well have carved its way through the English militia troops and reached the capital, with enormous consequences for the future. However, Parma and even the Armada commander, the Duke of Medina Sidonia, had serious misgivings about the plan. Crucially, it assumed that faultless military and naval co-ordination was possible over long distances when messages moved at the speed of a ship or a messenger’s horse. The Armada left Lisbon on 30 May, and after a long and stormy journey, finally sighted the English coast on 29th July. Over the next week it progressed up the Channel, pursued and harried by the English fleet, but suffering no real harm. The roadstead at Calais offered the only fleet anchorage within reach of Flanders (even though it was not a very safe haven), and the Spanish anchored there on 6th August. Soon after, Medina Sidonia discovered that Parma’s troops would not be ready for six days: Parma had only heard of the Armada’s impending arrival on the day that it turned up at Calais, and the Dutch were blockading his embarkation ports. The English arrived at Calais on the 6th, and dropped anchor about 1½ miles from their opponents. They were well aware of the invasion threat posed by the Armada and the Army of Flanders. The problem for them was that the strong defensive formation and formidable discipline of the Spanish fleet had made it impossible to get in amongst the enemy ships and do some real damage. Now that the Spanish were anchored, however, there was a new opportunity – fireships. Sir William Winter, a sea captain of vast experience (he was about 63 years old) claimed that he came up with the idea of a fireship attack on 6th August and suggested it that evening to the English commander, Lord Admiral Howard. It is possible that this is true, though the tactic was well known. It had featured in a book about tactics and weaponry called Inventions or Devices, published ten years earlier by the English polymath William Bourne, and Bourne probably got the idea from someone else (2). Even the Spanish were aware of the possibility of a fireship assault. Fireships were seen as the best way of attacking a strong, anchored fleet. The aim of the tactic was to spread panic among the sailors of the target ships. They would be forced to cut their anchor cables as they tried to avoid being burned, throwing the fleet into confusion and making it far easier to attack with cannon. Whoever came up with the notion, the plan was adopted by Howard’s council of war when it met in the early morning of Sunday 7th August. An officer was sent to Dover for flammables, but it was soon realised that he could not get back before the next day. As time was of the essence, eight privately-owned English ships were pressed into service as fireships. They were coated with pitch and tar, and filled with other fuel for the flames. Their guns were loaded, to make sure that they went off when the fire reached them, and each weapon contained two cannonballs, to maximise the impact of the attack. At 11 or 12 pm (accounts vary), with the wind and tide in their favour, the fireships set off. They were manned by skeleton crews, who set the ships alight and then escaped in boats. Medina Sidonia had already anticipated the possibility of a fireship attack, and detailed a small ship to tow any such vessels out of harm’s way. However, when the eight blazing ships loomed out of the dark, he gave orders for the fleet to get under way. No Spanish ships were hit by any of the fireships, and the Spanish did not leave the anchorage in panic. Despite this, attack had a critical effect on the Armada. The fleet was temporarily dispersed, huge numbers of vital anchors and cables were lost (in an emergency such as this, it was quicker to cut cables rather than raise them), and the wind pushed many of the ships into the southern North Sea. In other words, the fleet was moving away from Calais and its chance of linking with the Army of Flanders. With the Armada’s formation temporarily broken, the English were able to charge in among the Spanish ships. There was a pitched battle off the Flemish port of Gravelines the following day, just over ten miles NW of Calais. Rapid, close-range English fire caused heavy casualties and great damage. Only one ship was sunk by direct fire, though the battering off Gravelines may have weakened some Spanish ships so much that they succumbed to storms on the way home (a disaster exacerbated by the lost anchors and cables). The Armada resumed its formation after the battle, but the prevailing wind was still driving it further into the North Sea. The weather, and the pursuing English fleet, meant that there was no longer any realistic prospect of turning back and joining with Parma to invade England. Effectively, the Armada campaign was over, and the fireship attack was the key to the English victory. The Armada was a powerful, disciplined fleet full of experienced sailors and soldiers. What was it about a mere eight burning ships that made them break formation? Even if each fireship had destroyed a target, the Spanish would have lost no more than eight vessels out of over 120. The explanation is well known: Medina Sidonia thought that the fireships might be maquinas de minas, ‘explosion machines’. Floating bombs, in other words. I want to explore this aspect of the story in a second blog, which will be published on 12th August. That will be the anniversary of the day on which the English fleet broke off its pursuit of the Spanish, and the Armada began its catastrophic homeward voyage round the coasts of Scotland and Ireland. (1) The literature of the Armada is vast, but the account given here is based largely on Armada 1588-1988 (Penguin 1988), the catalogue of the 1988 National Maritime Museum exhibition, Colin Martin and Geoffrey Parker, The Spanish Armada, London (various editions 1988 on) and J K Laughton (ed), The Defeat of the Spanish Armada, Navy Records Society, London, 2 vols, London 1895 (reprinted Havant 1981). The latter is full of 16th-century documents, transcribed with modern spellings, and is a great introduction to the source material. Emotional. Cultural. Spiritual. Political. Legal, even. Names can come with a lot of baggage, one way or another. With people, names can tell you who a person is related to, who they were named after in the family, or sometimes even roughly when they were born. Likewise, the names given to ships have always carried a lot of freight, so to speak. In medieval Europe, it was common to name ships after saints and other aspects of divinity. The principal aim here was doubtless apotropaic, to secure divine protection from harm on a voyage. The sea was a dangerous place in the Middle Ages – storms or accidents could wreck the biggest ships (and still can), and there was always the danger of attack by pirates or privateers. This made ship-naming a matter of real significance, beyond the mere vanity of the owner. 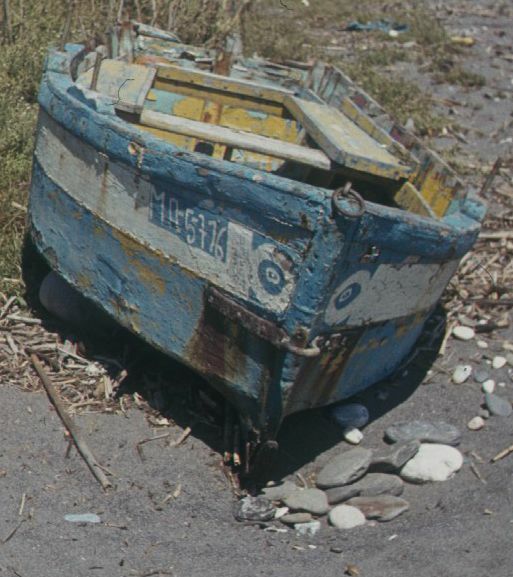 In a similar spirit, eyes were often painted on ships in the ancient Mediterranean, to ward off evil (see the photo for a relatively recent example of this). The regular re-use of a fairly limited number of names can lead to some confusion when it comes to studying medieval ships. For example, I’m currently finishing off a paper for The World of the Newport Ship conference at Bristol University (1). As part of this, I’ve compiled a listing of English and Welsh ships from the years 1439-1451. This includes vessels trading to Bordeaux for wine (a big employer of English shipping at the time) and ships that were arrested for royal expeditions. As a fair number of vessels get mentioned more than once, I’ve tried to whittle the list down to what a minimum of 321 actual ships by eliminating repeat references – not an easy job. To take just one instance, in 1443 the Devon port of Ottermouth had four vessels that were of the same type (picards) and were of the same size (30 tons). Each one was called Trinity! What separates them out is that they were listed at the same time, and each had a different master. When it comes to the kinds of names that these 321 vessels had, the results are predictable in one way (most were religious), but still interesting. Just over one in five of the ships (71) were named Marie or Mary, after the Virgin, the commonest name by a long way. This was followed by Trinity (35 ships), names related to Christ (Christ, Jesus, Saviour, 22 ships), George (for St George of England, 21 ships) and St Margaret (20 ships, a very popular medieval saint). The fate of St Nicholas, better known to us as Santa Claus, is strange: despite being also well-known as a patron-saint of sailors, only 14 of these vessels were named for him. He was just ahead of St Christopher, the patron of travellers, with 12 ships, but both were ‘beaten’ by St Katherine (17 ships). Even direct invocations of God, such as Grace Dieu, Goddesgrace and Godbefore, only occur in nine instances. Of course, it’s possible that some of the ships with saints’ names denoted family members, but given that people were often named for saints, the religious connection would not have been lost on contemporaries. Only a small number of ships had overtly non-religious names. These included the name of the Moton of Fowey, named for a piece of armour, or perhaps just a sheep (‘mutton’). Sometimes the religious names had a surname attached to them, identifying the owner. An example of this was the 260-ton Margaret Talbot of Bristol in 1451, which belonged to John Talbot, Earl of Shrewsbury. This sort of practise became much more common in the 16th century. What is particularly interesting is that in the overwhelmingly male world of late medieval seafaring, over one-third (121, 38%) of the ships invoked feminine aspects of the divine. Lest this seem too much like a kind of heavenly hit-parade, it has to be remembered that most of these names will have been intended to act as real defences against the very real terrors of the deep. And the ship called Barry of Fowey? Probably not a reference to the shipowner’s best mate Bazza, but a dedication to St Barry, an early-medieval saint reputedly buried at Fowey. 1. http://www.bristol.ac.uk/history/events/conferences/newportship2014; registration has now closed. There is also the matter of armament. The Snargate ship had enough gunports to mount about 180 guns in its castles. This figure may sound fanciful, but we know that the Sovereign carried 141 swivel guns in its castles, plus 20 guns in the waist (the open deck between the castles) and four at the stern. In other words, about 85% of its ordnance was in the superstructures. The layout of the ordnance in the Regent is not known, but it had 225 guns in total. Allowing for a similar disposition of weapons to that of the Sovereign, we would get a figure of about 191 guns in the castles, not many more than the number of castle gunports shown on the Snargate painting (4). The storm is violent, and eternal. Clouds like thick folds of cloth gather over the ship. A demon’s face looks out from one corner of the sky, its bulging eyes fixed on the vessel and the terrified sailors. The ship surges up on the waves, which are so high that the rudder lifts clear of the water. The perpetual tempest and the ship are carved on a wooden bench-end in the church of St Winnow, near Lostwithiel in Cornwall, which has some of the finest carved bench-ends in the county (1). 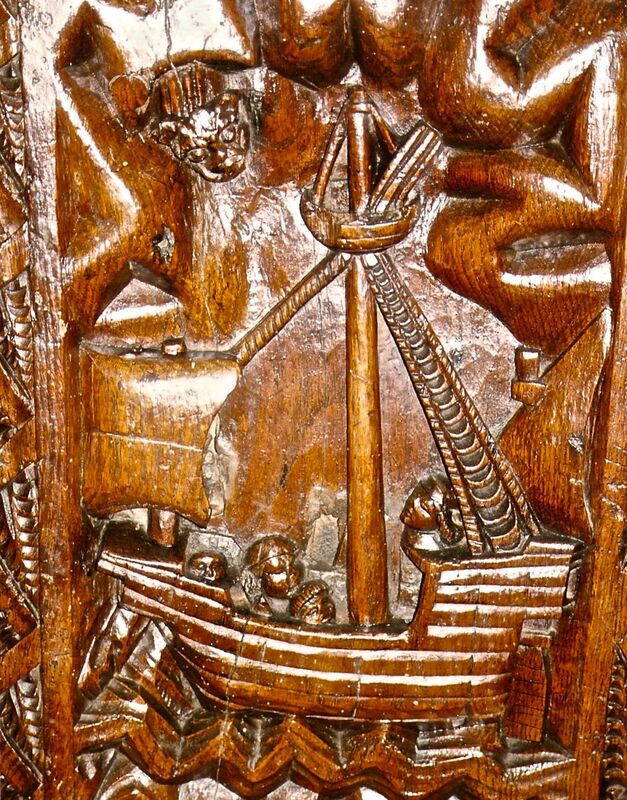 The St Winnow ship carving is well-known to those who study medieval ships. Like several of the other bench-ends in the church, it seems to date from the late 1400s/early 1500s. The ship is a square-rigger with three masts, sailing towards the left of the bench-end. The three-masted square rig was developed in the 15th century, by combining the four-sided square sails of North Europe with the triangular lateen of the Mediterreanean. It produced a much more maneouvrable type of vessel, which took Columbus and others across the Atlantic – something that happened at around the time this carving was made (2). A ship of this kind normally carried a large square mainsail hung from a sailyard on the mainmast (centre), similar in shape to the foresail (on the left of the photo). The mizzen sail is on the mast near the stern (right), a triangle stiff with wind. If the carver had shown the mainsail in place, it would have obscured most of the praying crewmen, who are a crucial part of the design. The church of St Winnow stands right by the river Fowey, a few miles upstream from the port of Fowey, which in the Middle Ages was a busy harbour. Seafarers must have worshipped at St Winnow in the 15th and 16th centuries, and to anyone who knew about ships at the time, the omission of the mainsail would have looked decidedly odd. It is possible that the missing mainsail was not the result of an artistic decision. This carving could be a representation of a real event in which a ship lost its largest sail during a storm, leaving the crew with just the fore and mizzen sails to make some headway against the wind and waves. We can never know for certain. The artistic explanation might still be the right one, as rigging fore and mizzen in a real situation of this kind could be suicidal, leading a ship to capsize. 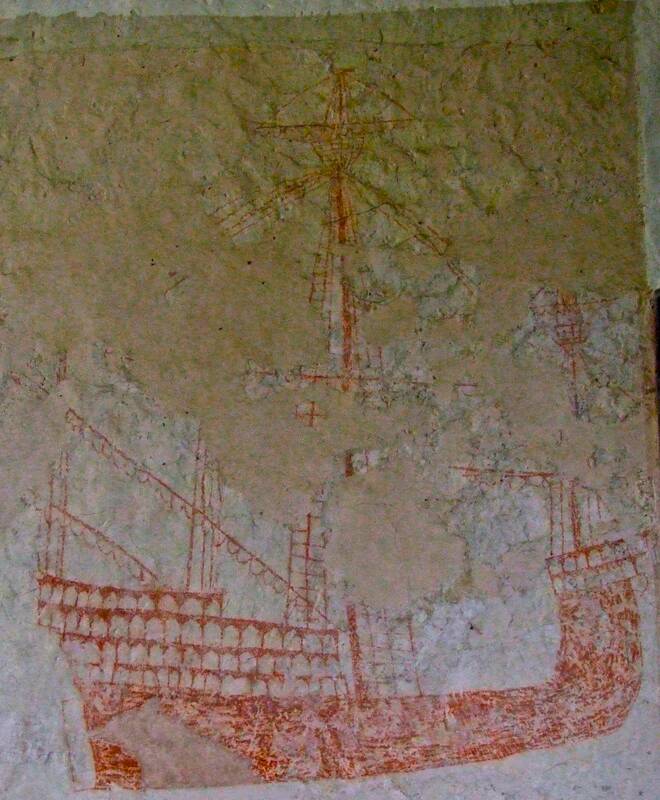 Even though as a ship image the carving is somewhat crude, it has a 3D quality – the artist tried to show both sides of the ship – and a lot of detail is shown. 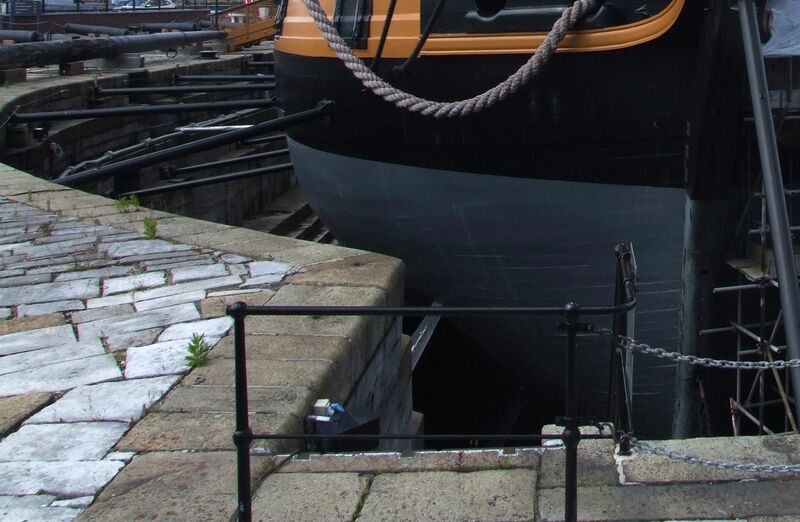 It has superstructures, a forecastle at the bow and an aftercastle at the stern, and the rudder is depicted realistically. The basket-like structure near the top of the mainmast is the topcastle, which served as both a lookout post and a fighting platform. Its military function is underlined by the presence of the bundle of long ‘sticks’ leaning on the right-hand side of the topcastle. These are gads, spears that could be thrown down on an enemy’s deck in battle, reputedly able to skewer a man from head to foot. The presence of these fearsome weapons is a reminder that there were also manmade dangers be found at sea in the Middle Ages – piracy and war. But why does this ship appear on the bench-end at St Winnow? The most likely explanation is that it was a votive offering, commissioned by a sailor in thanks to God and the saints for surviving a storm. The man was perhaps a shipmaster, and may be represented by the sailor’s head on the aftercastle (right). As the historian Eamon Duffy writes, votive objects were powerful, ‘immediately intelligible claims that here was a power to heal and rescue’. Votive artefacts could take all kinds of forms, such as paintings or carvings, but could also include models of various kinds or even graffiti scratched on church walls (3). Daily facing the most violent elements known to humankind, medieval seafarers would have understood this sentiment. (1) St Winnow or Winnoc was a 7th/8th century saint, venerated in Cornwall and Brittany: D H Farmer, The Oxford Dictionary of Saints, Oxford 1987, p 409. (2) I Friel, The Good Ship. Ships, Shipbuilding and Technology in England 1200-1520, London 1995, chs 5 and 9. (3) E Duffy, The Stripping of the Altars. Traditional Religion in England 1400-1580 (Newhaven and London: Yale University Press 1992), p 197.